Speed Skating Canada Cup # 2 Canadian Team Selection in Calgary, AB. 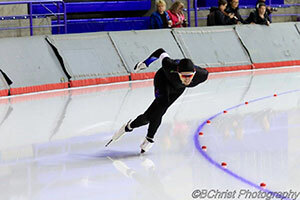 The Canada Cup # 2 in Long Track Speed Skating was held January 4-9 in Calgary. Guillaume Labbé was on the starting list. It was on this occasion that the selection of the Canadian team for the Olympic Games of Pyeongchang took place. With a 17th place in the 1500m, Guillaume was disqualified. Back from Calgary after the Olympic selection, he was not particularly happy with his results and thought he could do much better. Despite the defeat and with an Olympian resolve, he refused to be discouraged. Experience has shown him that there are new things he can do in training. He feels confident that the positive results are still ahead. Canada Cup # 3 took place February 2, 3, and 4 at the Pomeroy Sport Center in Fort St. John, British Columbia. Guillaume participated, more motivated than ever. The results are not available yet, but we know that a total of 129 long track speed skaters from across the country were registered. Lori-Ann Matte’s column – 4th Position at the Senior Canadian Championships! Established in Quebec since 1981, we have been working in the arena and curling club businesses since 1986. From its first day, the company has benefited from the precious expertise of its founder.